Indian Heads Value Trends since 1950. Here are the historic value trends for individual coins of the Indian Head Cent series. Since this coin type was minted for 50 years, the Coin Value Tables for all Indian Head Cents are carried on a total of five pages, including this one. Use the links below to navigate to any date of interest. 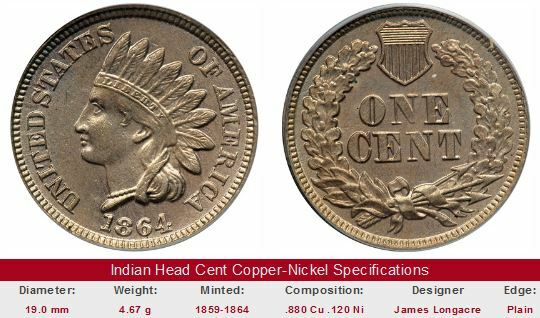 To read how this highly collectible coin came into being, link over to the Indian Heads 1859-1909 introductory material. Should you wish to study another US coinage type, then you'll want to return to the Coin Value Tables main page or utilize the "Get Historic US Coin Values" link in the upper right hand corner of this page. 1863 1864 CN 1864 Bronze 1864 "L"
Throughout the 1990s and into the new millennium, more grading subtleties were introduced within the framework of the grading system, including coloration of copper coins such as Indian Head cents. Brown (BRN) is considered "normal", while Red-Brown (RB) is more desirable. Red (RED) is the most highly prized color by discerning collectors/investors, and generally carries substantial premiums. The Coin Value Tables trend data for Indian Head cents reflect the historic availability of numeric grades and coin coloration to describe coins. For the 1950-1985 rows, the values in the "G-4" column correspond to the "Good" listing of those years, "VG-8" corresponds to "Very Good", and so on. The "MS-60 BRN" column records the "Uncirculated" value reported during those same decades. Similarly, "PF-65 RED" corresponds to simple "Proof" figures. Starting in the 1990 row, "Uncirculated" grades are broken down into "MS-60 BRN", "MS-63 RB", and "MS-65 RB", even though most Indian Head cent listings from that year placed little emphasis on coin coloration, deferring instead to a single value for a "typical" specimen. By the year 2000, however, value trends based on coloration were readily available, thus we see yet a wider representation of data based on copper color quality beginning in the Year 2000 row. Had a collector paid the "going price" in the early to mid-1990s for what was then a typical MS-65 Indian Head cent, one that eventually earned a RED distinction, he (or she) would have been rewarded with huge price advancements as the coloration phenomenon came into full vogue a few years later. Conversely, if another collector at the same time shelled out the same price for another typical MS-65 Indian Head cent that later had the misfortune to be classified as BRN or RB, he would still today be hoping to recover from the ensuing price collapse of non-RED specimens.